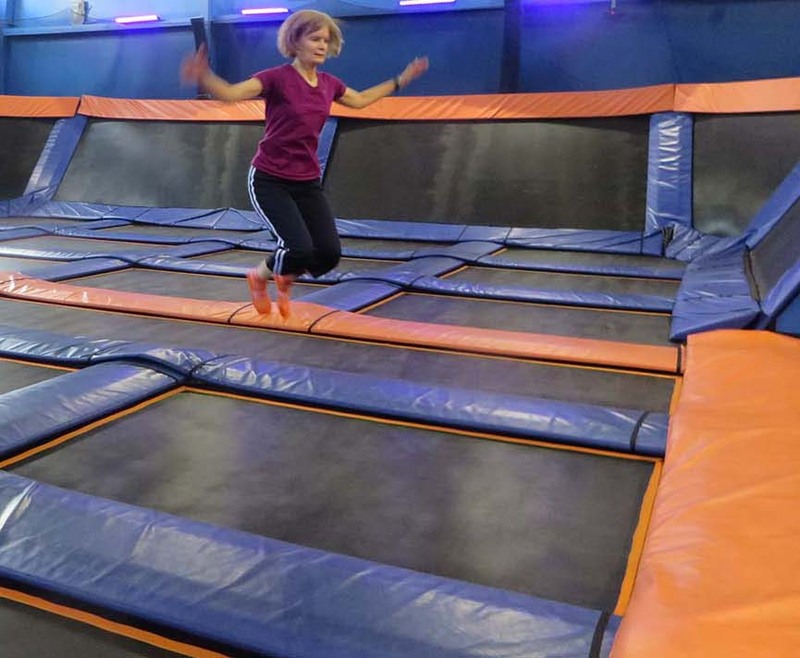 A huge indoor trampoline center near my house (Sky Zone) geared mostly to children, offers high intensity adult trampoline exercise classes. My friend Cheryl talked me into going because she knows I’m always on the lookout for unique workout challenges. We arrived Saturday morning not knowing quite what to expect. First, they gave us special glow-in-the-dark orange trampoline socks with sticky spots on the bottom so we wouldn’t slip. Then we headed back to a room as big as a football field filled with trampolines; each was about 7′ x 10′ and they were separated by foot-wide padded bumpers. 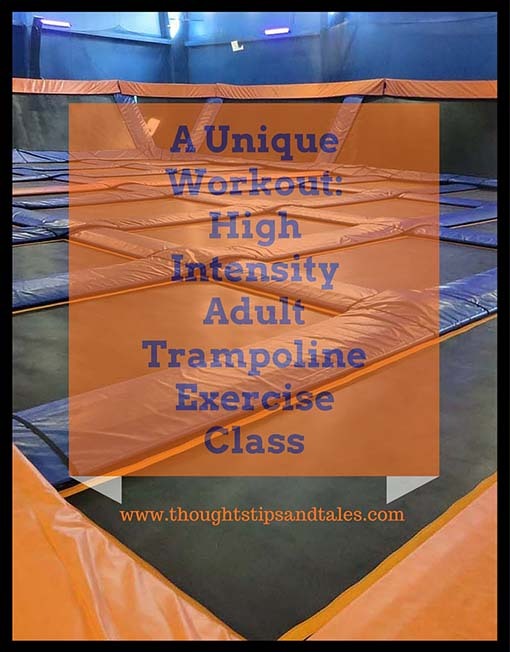 We each chose a trampoline section and followed the instructor as she led us through a lot of different cardio and calisthenic-type exercises. My goal for this class was not to break any bones, have visible bruising or leave by ambulance! We started with simple jumping — which made my legs feel like jelly for the first few minutes. It got easier, though. The teacher led us through all kinds of progressively more difficult jumps, lifting feet in the air and from side of side, knees to chest, and more. (I, however, kept to the steady, low jumping, waving my hands and arms now and then). My friend was a bit more daring! 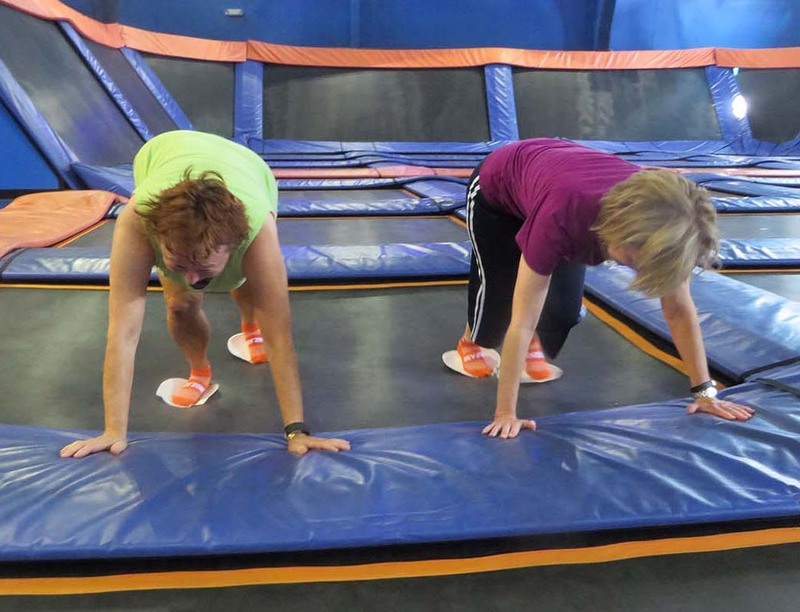 Later, we ran around the perimeter of the trampoline room, taking a few steps in each section, jumping over the bumper and running several steps through the next section, jumping over the bumper, etc. That was kind of fun. Cheryl and I jogged on the inside track while the more experienced participants ran near the edge of the room. One woman actually jumped from the trampoline sideways onto the wall and bounced off of it back onto the trampoline periodically; it was amazing! We used big plastic balls on a lot of the exercises, balancing our hands and feet on them in to do various plank-type holds. During one set, we partnered up and stood back to back with the ball between us, simultaneously squatting down and rising up. We also did various interval exercises, each person working her way down each section of trampoline in the row we were in, changing up every minute or so and moving on to the next section. Then we Army-crawled from the far side of the room on the bumpers back to the original spot. We did several exercises with white paper pates under our feet. 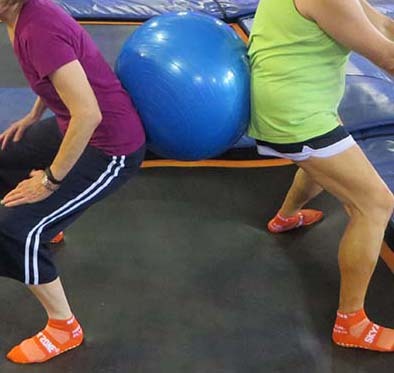 For one, we placed our hands on the bumper and our feet on the trampoline, sliding them in and out to the right side and the left side, then did another moving our feet forward and backward. The plates made the surface surprisingly slick, so you had to really control your muscles. The advertisement for it said you could burn up to 1,000 calories during a session and it felt like did! 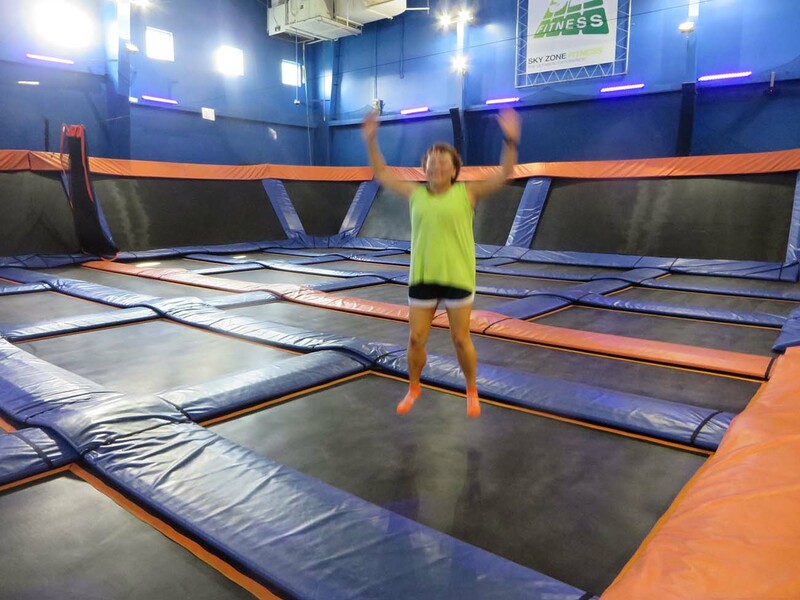 This entry was posted in exercise, fitness, trampoline and tagged adult trampoline exercise class, extreme trampoline workout, high intensity trampoline exercise, trampoline exercise class, trampoline fitness class. Bookmark the permalink. That sounds so fun! My kids used to have a trampoline and it was my favorite form of stress release. I wish there was a sky zone near my house. This looks fun! You can exercise and enjoy at the same time. I wish I could try this one time. Thank you for sharing. Thanks for stopping by, Holly. Looks like you’re the queen of trampolines! This sounded like a great way to workout! 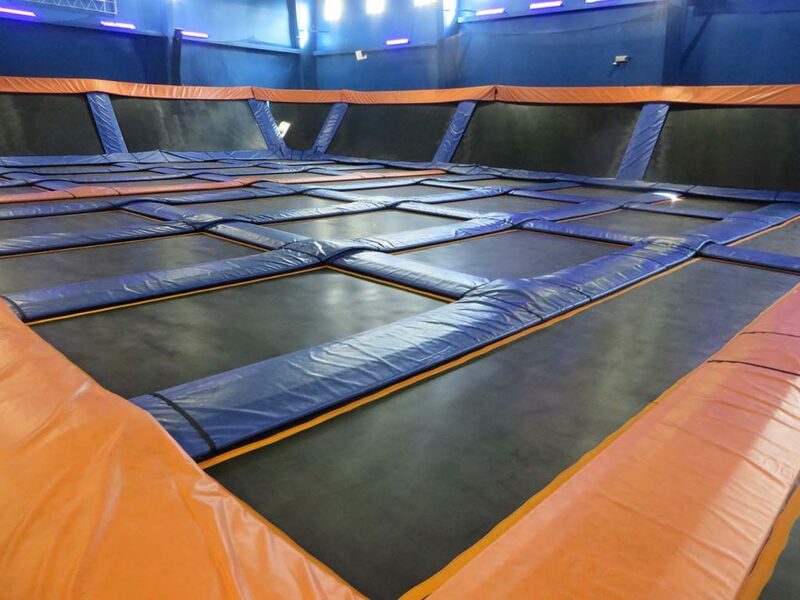 If only there was a trampoline zone closer to where I live. Trampolines are really fun devices. We had one, but after reading this blog, I feel like going and getting another.